sherapop's salon de parfum: His or Hers? 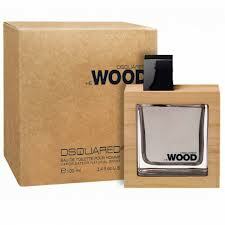 6: Dsquared2—He or She Wood? Il legno naturale che racchiude il profumo, rende il prodotto preziosamente unico, vivo ed originale nelle sue differenti venature. 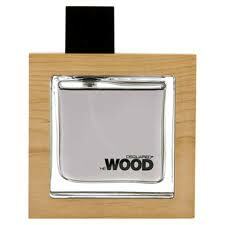 The natural wood framing the perfume, makes the product preciously unique and original in its distinctive grain. Le bois naturel entoure le parfum et avec ses différentes veines rend le produit précieusement unique, vif et original. We'll be the judge of that. Oh boy. It appears that the public relations team at Dsquared2 never learned, first, the correct use of a comma and, second, that all important lesson “show don't say.” Nonetheless, with violets looming large and purple in my mind, I decided to overlook all of the evidence and buy these perfumes blind since they were quite inexpensive and samples seemed pretty hard to come by. What did I find? I have to admit that the opening of He Wood is something of a turn-off. I smell basically a blast of that all-too-common and becoming increasingly and annoyingly more common pseudo-amberish/pseudo-cedarish aromachemical stuff—apparently it's a mixture of ambroxan and iso-E-super and what-not, and it's being sold by the ton to houses large and small. It is strong, loud, boorish and brash, and it often shrouds all of the other notes alleged to be present in the same perfume. Perhaps I am hyperosmic to the stuff. All I know is that I am smelling Le Labo Another 13 and Juliette Has A Gun Not A Perfume and Escentric Molecules Molecule 01 and Molecule 02 in way too many bottles these days, and most of them do not bear any of those names. Did perfumers blow it by revealing to us the secrets to some of their successes? Perhaps. Now that they've laid their cards out on the table, we know it when we sniff it, and if we happen not to like it, then this becomes the basis of an oft-repeated gripe. These chemicals undoubtedly serve to enhance facets of well-composed perfumes, but as focal notes they are not at all appealing to me. I am aware that Molecule 01 continues to be a best-seller at Aedes and other emporia, and perhaps that's why perfumers have been opening up the spigot and letting it flow long and hard, but I've just about had it with the stuff. It's gotten to the point where perfumes which feature that all-too-familiar scent are immediately removed from contention for a possible full-bottle purchase. No, thank you very much. I've smelled far too much of the stuff, and in places where I frankly think that it should not be. A recent truly off-putting example: Acqua di Parma Gelsomino Nobile, which does start out nobly but then the jasmine petals are literally throttled before being beaten to death by this base. Have I been spoiled by Miller Harris, whose wood-centric perfumes, En Sens de Bois, Fleurs de Bois, Terre de Bois, and others, actually smell like wood rather than aromachemical mixtures? Perhaps. I only know that I've had it with the vat-produced “neither amber nor wood” juice being used to substitute for loftier and more refined and, above all, more natural materials. I know that there are people out there who like the scent to which I am referring. I read reviews all the time by people who consider this scent to be the scent of wood. But it is not the scent of wood. It is the scent of aromachemicals. Fortunately, the opening of He Wood is only the opening, and it is moderated by an expanding violet facet—both leaves and petals—which arrives on the scene to rescue my nose from what otherwise would be an unwearable perfume. By the drydown, the blend is quite nice. It is sweeter than I'd have expected for a made-for-men fragrance, but it does not hold a candle to its fair sister, She Wood. It took me more than a year to write a review of Dsquared2 She Wood after having acquired a bottle because I was ambivalent about this perfume. I certainly loved the violets, but there was something about the aquatic side of the composition which kept me at a distance. Maybe that makes sense, since I do not usually like aquatic fragrances. What is interesting about this one is that it does not manifest any of the seasickness-inducing qualities so common in the aquatic category. I've now made some inroads into my 100 ml bottle, and never has She Wood made me feel angst-ridden or sick. So why was I ambivalent? I suppose because I felt and continue to feel that the quality is closer to the Salvatore Ferragamo Incanto series than to more sophisticated violet perfumes such as Histoires de Parfums Blanc Violette or L'Artisan Parfumeur Violette Verte. 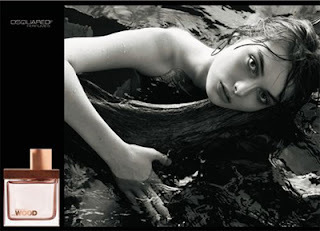 In terms of similarly priced violet offerings, She Wood is not very close to Trussardi Jeans (or its compositional cousin, Alexander McQueen My Queen), nor is it very much like the Sonoma Scent Studio violet perfumes. I recently discovered that She Wood does bear similarities to Ellen Tracy Bronze, but that's probably neither here nor there, since Bronze was discontinued after a short production life during which it seems only to have been sold at TJMaxx. Despite its name, She Wood seems very limpid and aqueous rather than opaque and woody, but there is just a tinge of wood in this composition, which seems to me closest to vetiver. Perhaps that is what makes this creation a bit odd. Rather than the usual treatment of wood, here we have a wood-flavored water. All perfumes are aqueous solutions, but this is a case where the water seems like an important note. This composition is not at all musky to my nose, and I think that floral woody aquatic would be the best category to place it in. As far as I know, it would be nearly alone, flanked only by Bronze. 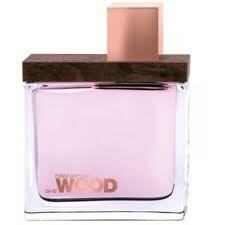 The violet and aquatic aspects are similar to Balenciaga Paris, but the smidgeon of wood sets She Wood apart. This is a likeable and wearable and public-space-friendly perfume. I am not convinced that it is unisex, but there are probably some daring guys out there who would not mind in the least smelling like sweet watery violets. Concluding Assessment: His or Hers? 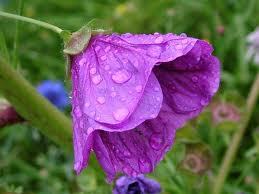 There are those who poo-poo the violet, considering it to be cheap and childlike. They think that because the scent of violets is easily mimicked using inexpensive ionones that somehow violet perfumes are less noble. My approach is different. I do not care how much the scent-making ingredients cost. So what if the scent of violet is cheap to produce? That just means more violets for me! So you see, my railing against the pseudo-amber/pseudo-cedar aromachemical STUFF is not really a snobby economic dismissal. No, I just think that it does not smell good, and when too much of it is used, it covers everything else about a perfume which might have made it beautiful. Small wonder, then, that in the final analysis, my vote today goes to Hers: She Wood. Neither She Wood nor He Wood contains much in the way of an authentic woody scent—as the names certainly imply that they should—but in She Wood I don't have to wait for the aggressive base to make way for the violets. No, they are there from the beginning, limpid, sweet, watery, and clean. Running Tally: His or Hers?